There are few truer mountain-town experiences than being awoken in the early dawn by the distant rattle of avalanche bombs. While providing an unmistakable announcement of fresh snow begging to get tracked up, they also serve as a not-so-subtle reminder that the mountains are a complex and often hostile landscape, demanding caution and respect. Despite being romanticized as little more than “throwing bombs, skiing powder, and breaking hearts,” avalanche control at a ski resort is a highly technical profession, requiring extensive training in explosives, first aid, weather forecasting, and snow science. But it wasn’t always that way. 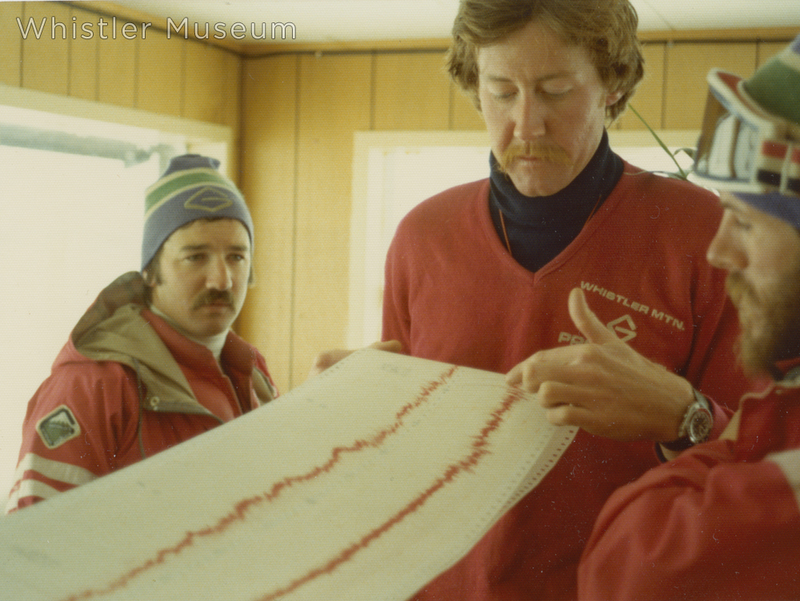 When Whistler Mountain first opened in 1966, the concept of snow science barely existed, and the only technical avalanche manual in North America was almost 15 years old. Setting up the Avalauncher artillery gun, to clear the upper Harmony Zone. 1970s. Learning to safely harness the destructive power of avalanches took time and dedicated practice by hundreds of individuals. 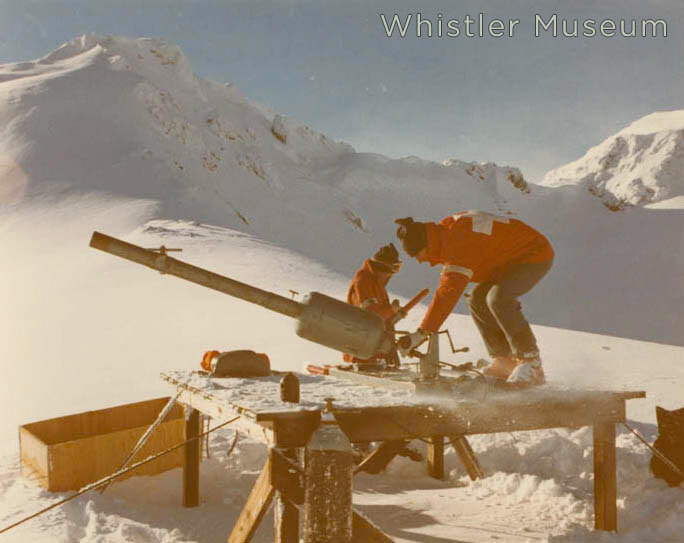 We recently spoke to one of these pioneers about the nascent years of avalanche control work on Whistler Mountain. Bruce Watt (centre), Roger McCarthy (left) and an unidentified patroller examine the wind data from their anemometer. After his inaugural Whistler season, John set our working as an avalanche professional for mines up north and in the interior. Then, an incident during the winter of 1972 served as an eye-opening and watershed moment for the patrol. A typical Coast Mountain winter storm blanketed the mountain in several feet of snow. Four skiers went missing during the blizzard, and it took several days to determine that they had been caught in an avalanche, whose debris had subsequently been buried by even more storm snow. After that incident it became painfully clear that avalanche control was a serious and crucial aspect of ski area management. That same season, advances in the Avalauncher system brought their gun out of storage and it was installed on a platform near the top of the t-bars. 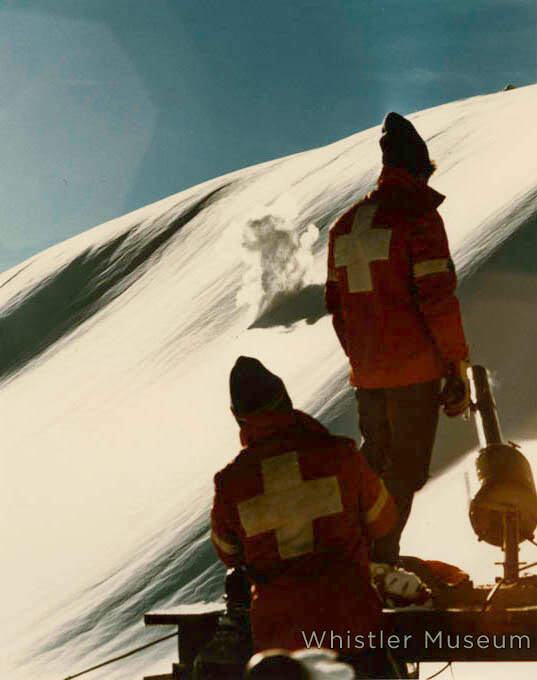 Being able to trigger avalanches from a distance made the daily control routine safer and less-gruelling. A snow ghost dances after the Avalauncher does its thing. Patrol surveys the debris of a large slide in Glacier Bowl. 1970s. 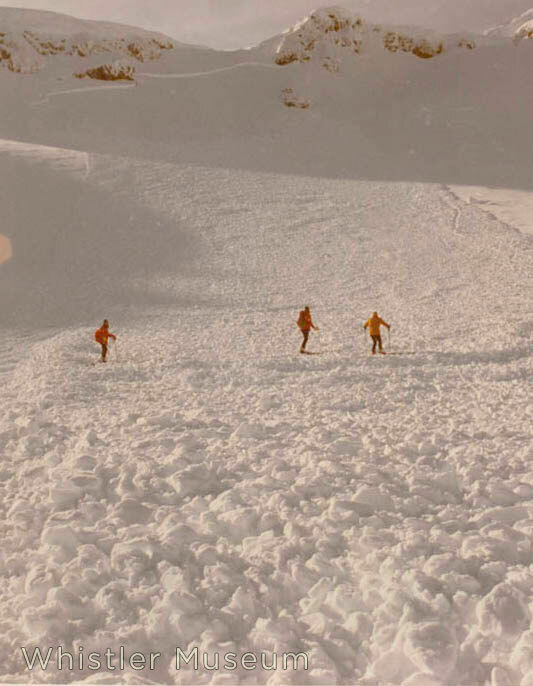 Great footage from a north-facing slide on Whistler Mountain, 1979: *embedding disabled by user, please click on link to watch vid…it’s a gooder!